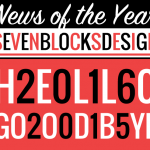 Seven Blocks Design has been working behind the scenes in 2016 to revamp our own brand and website and we are excited to launch it. Many aspects of our previous brand and website were working pretty well — communicating our friendly style of working and showcasing the work we’ve done. However, Seven Blocks Design has evolved from the solo work of Diana Hobstetter to include a range of team members to address bigger project needs. 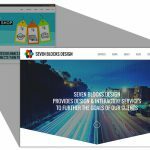 Though we’re still just as friendly, and continue to work on projects both large and small, it was time for the Seven Blocks Design brand, logo and website to reflect our more sophisticated offerings. We believe the new logo reflects that sophistication and confidence, yet still conveys a sense of playfulness and vibrancy. 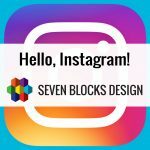 The concept is still based on building blocks, stemming from “7 blocks” concepts of social media and user experience that first inspired the name. But now the blocks have greater depth and by fitting together with hexagonal shapes, evoke the interconnectivity of the building blocks in shaping a brand’s presence. The full spectrum of foundational colors are still there, but are now more than a “cute” rainbow. 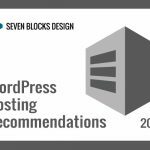 The website has been pared down to the essentials and made cleaner, while still reflecting a bit of playfulness (Rubik’s cube, carousel, crayons, and bright primary colors). We are working to make our services clearer, and will continue to add helpful resources both on the Services page and in our Ideas section. We’ve also added a new interactive online questionnaire for new potential clients and projects. So go ahead and fill that in and let’s get your project started!